I blame George Clooney, myself. Simpering and smirking at us over his coffee. With the promise, we too can feel like a Hollywood star of old. IF we just clutter up our kitchen tops with some monster of a machine. PLUS 20 different blends of coffee at least 17 of which no one in the family can EVER be persuaded to drink. Well. He’s got kids now hasn’t he? Filling the kitchen full of coffee machines and little capsules and so on’s NOT such a great plan is it George when your coffee’s swigged cold two hours after you first made it! BUT seriously we do lose something. In the clutter we collect for tea & coffee making. At it’s best, it’s a ritual. A lovely quiet moment to stop in a busy day. A chance to savour simplicity. AND all that clutter taking over our worktops and jamming up cupboards just complicates it. Pop them in your charity bag. Or on your sell list. Or in the bin if they’re really, truly done for. AND don’t fall for George and his ads again. Remember he’s part of a marketing machine. Convincing us to buy stuff we cannot possibly enjoy – however wonderful it might be! – because we already have TOO MUCH. We have no time. No space. To enjoy more. Well done for anything you let go. We all know the marketing machine is full of tricks to get us to buy more. Trying to create new “needs”. When we could quite happily make do. BUT what gets me hopping mad is the way they sneak clutter in to our homes. Nespresso don’t pay George Clooney from the money they make from coffee machines. It’s the capsules that bring in the dollars. Lots of us end up stock piling them. Cluttering our homes with boxes full we will NEVER use. And it’s the same for a bunch of other products. From electric toothbrushes to printers. The real money is made from the disposables. And the marketing machine tries every trick to get us hooked on them. 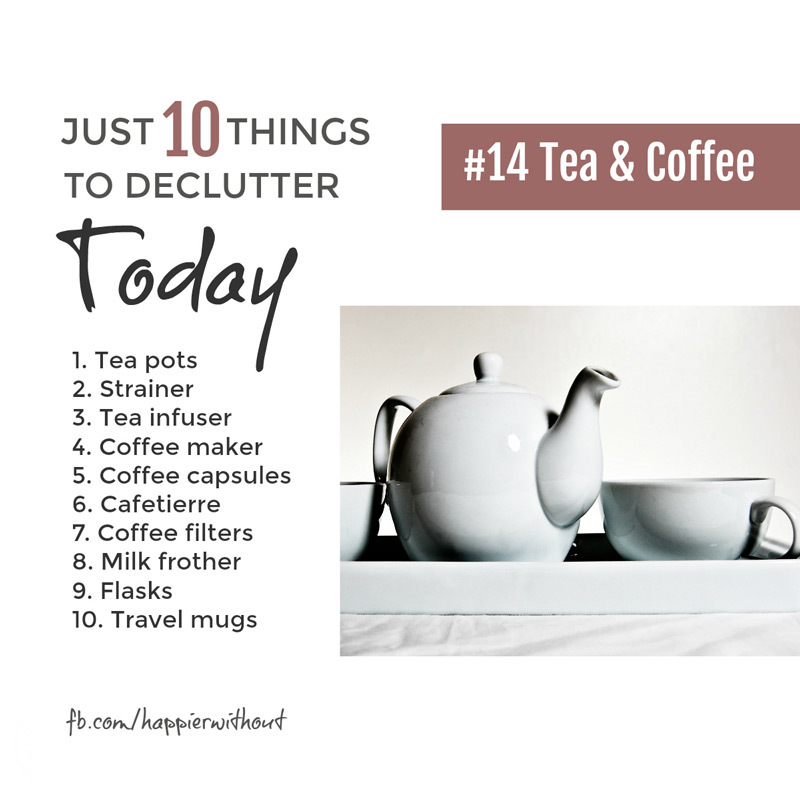 So watch out for never-will-be-used hoards of disposables in your tea and coffee clutter. And next time try to buy only what you need. George doesn’t need our money, we do!